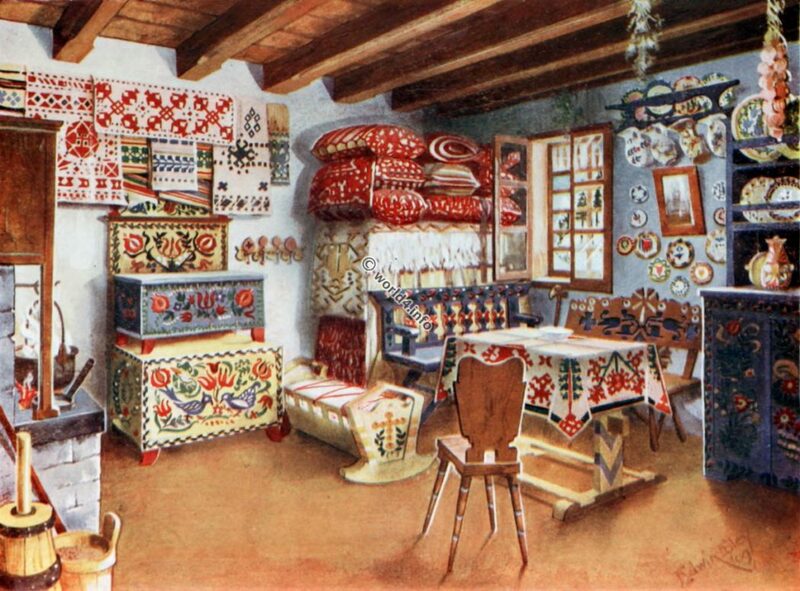 Home » Furniture » Hungarian Peasant Furniture, 18th c.
of Austro-Hungary behind in the retention of her peasant costumes, the furniture and peasantry – whether Magyar, Teutonic, or Slav-yet retains much peculiarly naive charm. The arrangement of the furniture in the Hungarian peasants’ living rooms differs somewhat with the district; but the walls are invariably whitewashed, and the floor of earth, trodden down, but retaining its dark rich color. The colorings, pattern, and construction of the painted pine furniture are traditional. Over the stove indicated in the left-hand corner, with a cupboard above, the primitive family cooking is performed, the cauldron being then placed upon the table and the family helping themselves therefrom. The bed in the corner by the window is worthy of notice. First come the mattresses, which are covered with a rough linen cloth embroidered very finely, having the effect of a narrow braid sown on in the pattern; over that is placed a large sheep-skin covering, and on the top the pillows, which are of linen embroidered in red cotton at the end, in the same pattern as the bed covering, and fastened by a narrow red cord laced through the linen. These huge pillows are invariably stowed on top of the bed in the fashion shown, at the daily conversion of the bedroom into the living room, and are, it must be admitted, distinctly decorative. The cloths hung over the cupboard are embroidered in the same stitch as that used for the bedding. This stitch is called Kalotaszeqi, from the part of Hungary in which it is made. The table-cloth is also hand embroidered. The peasants make beautiful needlework; indeed, it is difficult to believe that the women who make these delicate embroideries are in summer doing the roughest work in the fields. These womenfolk too, during the absence of their men in the fields at springtime, in many parts of Hungary, Croatia, Bohemia, and Moravia, repaint the insides and outsides of their houses in the same traditional rich colorings. The embroidered towels are hung as decorations upon the whitewashed walls, Wedding chests, placed one upon another, are still regarded as the supreme articles of furniture, and their design and color as almost sacrosanct. The prevalence of the pomegranate in these peasant patterns is noticeable. The cradle has much loving labour expended upon its decoration. The pottery shown is also of traditional peasant patterns, and hand made. In the colder districts of Hungary double windows such as shown are universal. Much might be written upon the peasant arts. These notes and the accompanying color plate-in part derived from sketches of examples in the Viennese Museum für Volkskunde, in part from the studies of (née) Mdlle. Sari Baumgarten of Budapest – touch but the fringe of the subject. Indeed, one regrets the space necessities which prevent pictorial presentment of a series of peasant and Oriental equipments. Source: The book of decorative furniture, its form, color and history by Edwin Foley, 1910. Previous PostS.C.Bajuwaren München 1910 e.V. Next PostA COLT ADVERTISING SHEET OF ABOUT 1850.